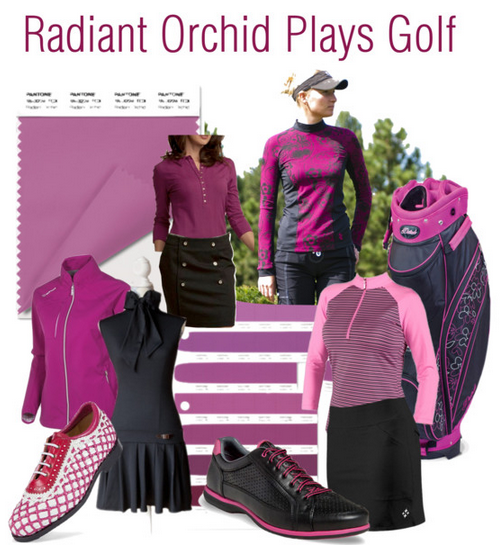 GOLF GIRL'S DIARY: Radiant Orchid: The Lively Friend You Bring To A Boring... Golf Course? Radiant Orchid: The Lively Friend You Bring To A Boring... Golf Course? Are you ready for some on-course radiance? Well, meet Radiant Orchid: The Pantone Color Institute's 2014 Color of the Year. Twenty-thirteen had Emerald, a color that lends itself...quite organically... to golf; from Augusta National's famous jacket to the verdant fairways and greens we play on, Pantone 17-5641 was a natural when it came to golf style. Emerald green golf apparel and accessories were an easy fit. While this new COY may not scream golf the way its predecessor did, Radiant Orchid will no doubt be prominently featured in apparel collections at this year's PGA Merchandise Show later this month... and will surely start showing up on fairways and greens in the coming months. Leatrice Eiseman, executive director of Pantone Color Institute, likens the pink-purple hue to "the lively friend you bring to a boring party". I'm guessing this unapologetically feminine hue will be livening up a few golf courses this year. Radiant Orchid? Didn't they used to call that color Fuschia? I'm confused. In with new! I love Radian Orchid and I'm already seeing it in the shops and on the streets. Golf courses will be next. I got my husband a Radiant Orchid sweater vest from RLX Golf. They call the color Modern Pink. It might be a traditionally feminine color but it looks great on guys too. group color. Have to have it somewhere on you to bring the golfers together. Pictures turn out great with a theme color.